On Dec. 7, 1941, at 7:55 on a Sunday morning, hundreds of Japanese fighters, bombers and torpedo planes roared across the sky, unleashing the force of an empire on unsuspecting Americans below. Seventy-seven years ago, Japan’s surprise attacks on Pearl Harbor killed more than 2,400 Americans and left another 1,282 wounded. Each year on this infamous date, the USO remembers those who perished and honors the resilient survivors who manned their weapons and ran into harm’s way to rescue the wounded and recover the deceased. The USO, in its infancy at the time of the attacks, was on the ground in Hawaii to care for and support American service members and military families that survived the Japanese assault. Before Dec. 7, the Hawaii USO was operated mostly by volunteers. It held dances, provided entertainment and served the recreational, social and spiritual needs of Hawaii’s military community, according to the USO’s 1942 Annual Report. The attacks forced the 10-month-old, volunteer-run Hawaii USO to transform into a disaster relief agency in mere hours. 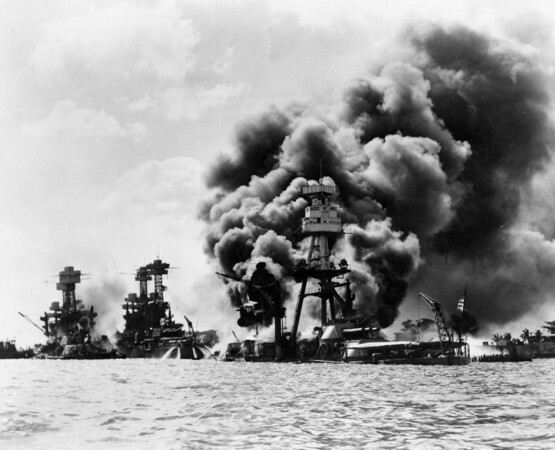 The USS Arizona (BB-39) burns after the Japanese attack on Pearl Harbor on Dec. 7, 1941. 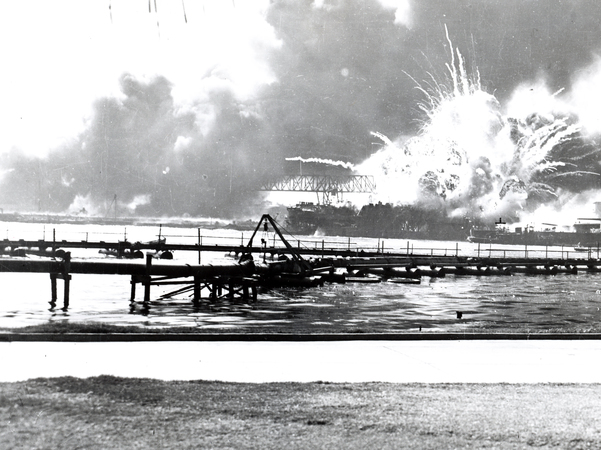 The USS Shaw explodes during the attack on Pearl Harbor. 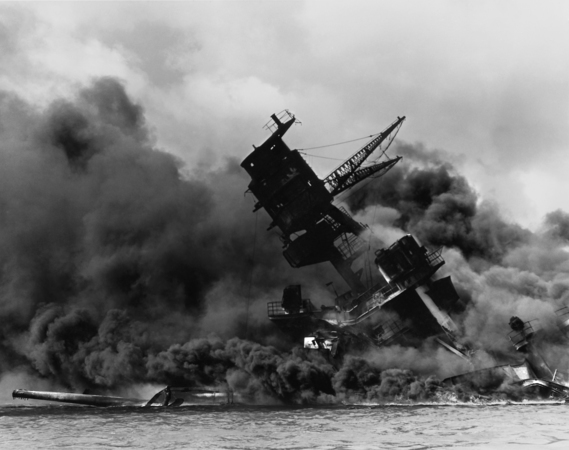 The USS Arizona burns and sinks following the Japanese sneak attack on Pearl Harbor, Hawaii, Dec. 7, 1941. In the background are the battleships USS West Virginia, left, and USS Tennessee, both damaged during the attack. The first Japanese plane shot down during the attack on Pearl Harbor on Dec. 7, 1941. 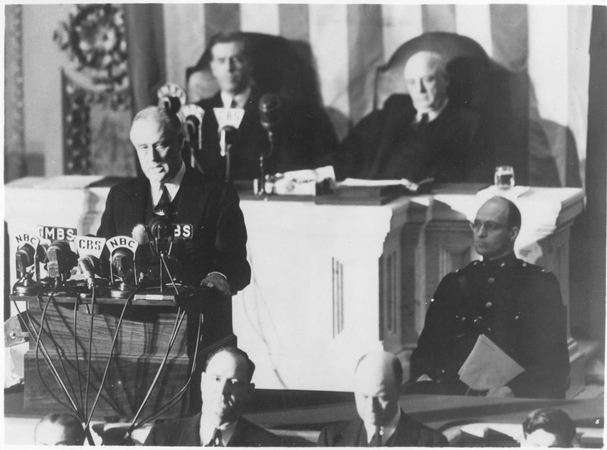 President Franklin Delano Roosevelt delivers his “Day of Infamy” speech to Congress on December 8, 1941. Behind him are Vice President Henry Wallace, left, and Speaker of the House Sam Rayburn. To the right, in uniform in front of Rayburn, is Roosevelt’s son James, who escorted his father to the Capitol. In the immediate aftermath of the tragedy, the USO sprang into action. More than 1,000 displaced women and children from nearby bases arrived at the USO Army & Navy Club in Honolulu seeking shelter, food and in search of lost friends and relatives. “Cots were set up in the gymnasium and women and children slept there until Honolulu citizens took them into their homes,” the 1942 Annual Report said. A card-filing system was set up by the USO to help displaced military families finding housing and to help locate friends and relatives. Volunteers and others took turns playing the piano and leading singalongs of familiar songs, which helped to ease tension, according to the report. Even in 1941, in the worst of circumstances, the USO was there to support military families and keep them connected to the people and places they love. In the months that followed, the Hawaii USO expanded to support the rapid influx of American troops deploying to the Pacific theater. By the end of 1942, the Hawaii USO had grown from a small, volunteer operation launched on Oahu to a regional operation with 80 employees, 400 USO Camp Show entertainers and more than 3,000 loyal volunteers. Fifty-one USO clubs dotting five Hawaiian Islands were visited more than 2.6 million times in the year after the attacks. A version of this story first appeared on USO.org in 2017.